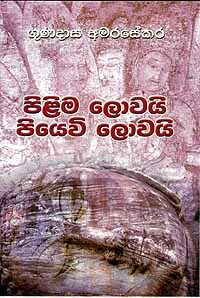 In l986 or so when Gunadasa Amarasekera visited the ancient city of Polonnaruwa he was shocked by what he saw at the historic Galvihara temple. There was the replica of the hallowed Galpilimaya, which had achieved notoriety by then, having lain on the streets of London, and later in our dockyard (to be urinated upon) now alongside the original. It was also been worshipped by devotees. The sight made the writer reflect on the times could there be anything more symbolic of the charade of the dharmista age, which was hoisted upon an unsuspecting public by a cunning politician? This was symbolic of the age - the age of the counterfeit. The story Galpilimaya Saha Bolpilimaya  was a result of these reflections. The story revolves round a father and a son and a friend of the son who has turned out to be a rebel. The father is the dedicated watcher who feels that he has been entrusted to look after the Galpilimaya by the gods. He is very perturbed by the arrival of the Bolpilimaya, and he is very angry about it. But his protests do not register with the gullible public who prefer the glossy Bolpilimaya to the old solid one. His sensitive son who belongs to the new rural intelligentsia sees through this charade and tries to enlighten his father. He is extremely concerned about the dilemma faced by his father. The story ends with the blasting of the Bolpilimaya which remains a mystery. The present work Pilima lovai pilima lovai- the world of statues and the world of reality  unravels this mystery, and deals with what happens afterwards. The narrative touches upon the changes that have taken place in our society during the last decades and especially those changes in ideology and politics undergone by the youth - the young intelligentsia of this country. These two short works would remain as an epitaph to an age that appears to be coming to an end soon.